SIGNS OF ANGER appeared in front of the site of the proposed 15 Main Restaurant in Narrowsburg this past week after the Town of Tusten Planning Board declined to sign off on a needed permit. 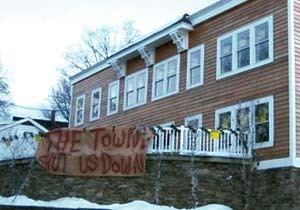 NARROWSBURG  December 27, 2005  It was a meeting that surely will not soon be forgotten by the Tusten Planning Board and those in attendance Monday, December 19, at the Tusten Town Hall in Narrowsburg. The issue? The Santana Building located on Main Street in Narrowsburg. Nick and Laura Santana purchased the building three years ago and at the time produced a set of plans to the board of what they were planning on doing. Laura Santana noted that she worked closely with the code enforcement officer and the board so as to have a new restaurant open for the holiday season, but with recent developments, the building will not be open anytime soon. Chairman Ed Jackson noted that the board had not received what was needed to grant a special use permit. "I am informing the board that I recently received a new set of plans from the Santanas, and I should not have accepted them due to the fact that this board does not accept plans a week before a meeting, but I did accept them," he said. Jackson went on to note, "In regards to the building, the clients have not met this boards requirements. We cannot approve something we have no information of. They have given us an outdated site plan. We need to see an updated site plan as well as a survey, and we need to see drawings of the buildings setbacks and so forth, which we do not have." He continued, "The Santanas have not provided any information in regards to the dimension of the parking and distances, pedestrian walkway areas, electrical or architectural plans. We have not seen anything about sign placements, lighting or even seating capacity  these need to be shown to us. If we do receive the necessary information and the revised plans, then we could possibly schedule a public hearing." Jackson's comments did not sit well with Laura Santana, who appeared with her architect and all of her plumbing and electrical contractors. Buck Moorhead, the Santanas architect, noted, "We have provided you with drawings and maps, and we have done everything required. "Your town engineer, Robert Meyer, followed us with everything we did. He never asked for a survey map. He knew that we were not changing the building and that it was to be an eating and drinking establishment. We did not increase the size of the building, and we did add the Dumpster area and the handicap section as he wanted. Meyer asked us for a site plan, and we gave that to you ... and now youre telling us you need a survey." He added, "I do not see an issue here, and the special use permit should be granted. Yes, there may be some small issue to address but nothing to prevent this building from opening. Meyer only asked us about the septic, and we addressed that. There are no environmental issues, and we felt everything was in order." However, since Meyer has become the countys commissioner of Public Works, the town has hired a new engineer by the name of Tim Gottlieb, who has different views. "I have reviewed this issue, and we do need a survey, and there are a list of things that have to be met before any approval is given," he said. Moorhead disagreed, "Now you have a different town engineer, and we have to go back to the beginning  that is unfair! We did everything Meyer wanted, and now since you have a new engineer the rules change  that is unjust." Town Attorney Jeffery Clemente then noted, "The problem here is that we have a scribbled survey, and nothing has been properly done and never has been. Now, we have a responsible engineer, and we have to follow him. The board needs adequate plans, and if they are not provided, we cannot do anything. What Meyer did is what he did, but now we have someone who is very competent, and we will follow his suggestions." Clemente raised another issue, too. "Has the fire department reviewed this? I do not feel that the Narrowsburg Fire Department is adequately trained to fight a fire on the second floor of a building that has a kitchen." Jackson asked Fire Chief Craig Burkle, who was in the audience, if he had a problem with the building. "If the proper fire protection system is installed and sprinklers and fire extinguishers are in place, then I do not have a problem with it, Burkle responded. I have seen the building recently, and they have installed what is required. I have done a walkthrough of the building, and we have become familiar with it." The meeting then turned heated. "I do not understand why now you want this survey, said Moorhead. There has been no change in the use of the building." "The board has the right to request a survey, and for two years nothing has been given to this board," responded Clemente. "We have to approve the first building, and now they want to put an eating deck on the second adjoining building, and we do not know how many people that will hold either, said Jackson. We have never received working plans." Mike Eckert, who was in the audience, then said, "You, Mr. Chairman, have been at the building and seen the work being done. It is not right what you are doing to these people who are just trying to open a business. Your Code Enforcement Officer, Stephen Stuart, has also been there, and they have been working with him, and everything is the way it should be. You are hurting yourself and the town  you are doing the wrong thing here tonight." When Eckert's tone grew louder, he was asked to leave the meeting by Jackson. But then Laura Santana stepped in: "We have done everything you have asked. I have submitted the information you wanted and even working plans that you have right there. Nothing has changed, and now to ask for all this other stuff because you have a new engineer is crazy. We have done everything you have asked. The building has not changed, so why ask for another survey? I have a restaurant ready to open and because of this we cannot. This is wrong!" Jackson responded, "You have not complied with what we have asked for. Tonight is the first time the board has seen these new drawings." Said Clemente, "We now have a competent engineer, and he is requesting the survey. The applicant does not understand the responsibility and needs to listen." "If tonight we grant a special use permit, we are setting an example that we will grant things without surveys, and that is not how this board works, added Jackson. We have not received stamped plans, and the plans we have before these recent ones are from 03." "Those plans are what I have been working with, Santana replied. You know what I am doing, and you, Mr. Chairman, have even asked me about certain things, and I have done it." Jackson said the board was going to the back of the room in an executive session for a discussion, The board, however, did not officially recess from the regular meeting to go into executive session under a motion and did not come out of the session with a motion to go back into a regular meeting format. Upon returning, Chairman Jackson stated that the board is requiring a new survey, and when the survey is received, a new public hearing will be held. Local resident Ron Barile fired off this statement to the board: "You people are wrong. You should be ashamed of yourself, and this board should be ashamed. These people are trying to do good for this town, and you will not let them for some reason. Jackson, you are a disgrace." And with that, Barile took the gavel from Jackson and tossed it across the room. But he wasnt done. Turning to Clemente, he said, "Your building is a disgrace, and you are a slumlord. You have tenants with no water, and it is a disgrace  you should be ashamed of yourself and what you have done here tonight." After much screaming between Jackson and Barile, Jackson angrily stated, "I am calling the State Police and having you arrested, and I will be calling people in this room as witnesses. I will file a formal complaint for disorderly conduct, and I want you out of here!" Barile did leave, but not without remarking further of his disgust with the board and its members. The State Police were called to the meeting but did not arrest anyone, and the board tabled any decision on the Santana building. The day after, signs appeared at the Santana Building, located on the corner of Main Street in Narrowsburg. The building was the former Kelly Adult Home and was purchased a few years back by Nick and Laura Santana.